Children in Indonesia amid a field of plastic waste, all imported from the US, EU, and other Western nations. We are in a plastic crisis. Plastic pollution is everywhere we look, smothering our oceans and poisoning communities around the world. Meanwhile, Big Plastic only plans to expand production. We need to chart a different course. From city streets to the arctic ice sheets¹, plastic pollution has reached every corner of the globe. But it’s not just the plastic we can see; tiny particles of plastic called microplastics are showing up in our water², our food³, even the air we breath⁴. This flood of plastic is poisoning communities and smothering our environment, threatening whole ecosystems. 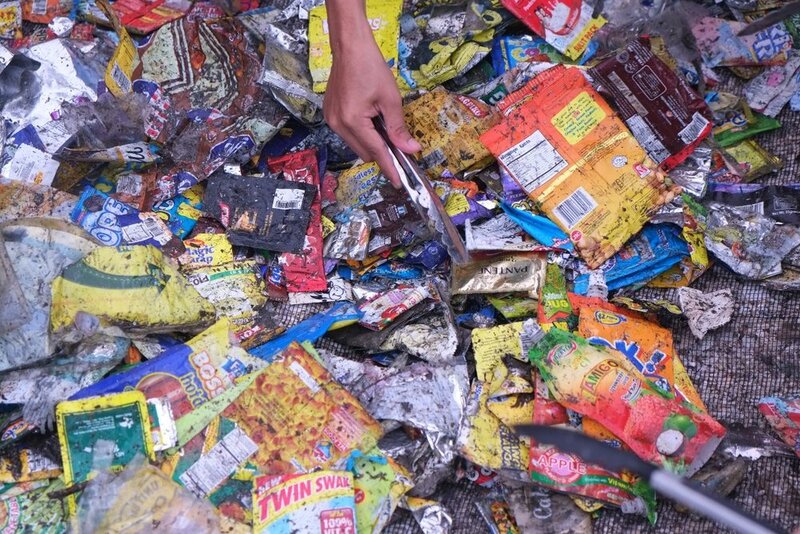 Multinational corporations based in the global North flood developing countries with low- and no-value plastic, like this packaging collected during a brand audit in the Philippines. This isn’t a waste management problem; it’s an unmanageable problem. There is simply too much plastic being created, and nowhere for it to end up besides in landfills, in the environment, or being openly burned⁵. Indeed, only 9% of the plastic ever created has been recycled⁶. Despite this mounting crisis, big industry plans to keep producing more and more plastic each year. Big Plastic and its allies are investing billions to expand production capacity, with a planned 33% increase in the production of plastic’s chemical ingredients by 2025⁷. Meanwhile, the United Nations estimates that by 2050, there will be more plastic than fish by weight in the ocean⁸. We’re even learning that plastic contributes to global warming when it degrades in the environment⁹. If we don’t change course – and soon – we face a future in which the consequences of our plastic addition will only grow more severe. Developing countries like Indonesia are flooded with so much plastic waste from Western nations that there is little else to do with it but burn if as cheap fuel, releasing toxic fumes full of dioxin and heavy metals into communities. ¹ “Record levels of plastic discovered in Arctic sea ice.” The Guardian, April 24 2018. ² “WHO launches health review after microplastics found in 90% of bottled water.” The Guardian, March 14 2018. ³ “From fish to honey: nothing is safe from microplastics.” World Economic Forum, June 11 2018. ⁴ “Tiny plastic particles are 'part of the air we breathe' say scientists and can damage lungs, poison kidneys and even interfere with our hormones.” Daily Mail, March 18 2018. ⁵ “Give me convenience or give me death.” The Story of Stuff Project Blog, November 30 2018. ⁶ “A whopping 91% of plastic isn't recycled.” National Geographic, December 20 2018. ⁷ “Fueling Plastics: How Fracked Gas, Cheap Oil, and Unburnable Coal are Driving the Plastics Boom.” Center for International Environmental Law, September 2017. ⁸ “The New Plastics Economy: Rethinking the future of plastics.” World Economic Forum, January 2016. ⁹ “New Study Shows Plastics Release Greenhouse Gases, Contributing to Climate Change.” Surfrider Foundation, August 2018.